Three astronauts successfully blasted off Monday to the International Space Station, a perfect launch following October’s cancelled mission. 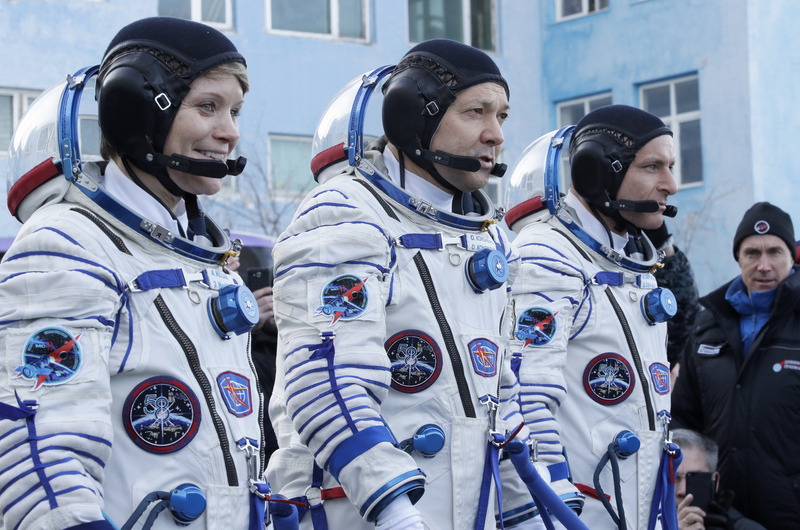 NASA astronaut Anne McClain, David Saint-Jacques of the Canadian Space Agency, and Oleg Kononenko of the Russian space agency lifted off as scheduled yesterday in Kazakhstan. Their Soyuz MS-11 spacecraft entered orbit just under nine minutes after the launch. It docked at the space outpost in about six hours—after making four orbits of the Earth. McClain, Saint-Jacques, and Kononenko will spend more than six months doing research and experiments in biology, Earth science, physical sciences, and technology. The three-person crew already aboard the space station eagerly awaited the new arrivals. Those astronauts are scheduled to return December 20, just in time to spend Christmas on Earth. The families of the crew, other astronauts, and space officials from several nations breathed a sigh of relief after the flawless launch. On everyone’s minds was October 11’s unsuccessful launch—when a Soyuz-FG rocket carrying NASA astronaut Nick Hague and Roscosmos’ Alexei Ovchinin failed two minutes into flight. That activated an automatic rescue system that sent their capsule plunging back to Earth. Both men managed to emerge shaken but safe. (See “Astronauts Safe After Emergency Landing.”) A Russian investigation blamed a damaged sensor for the problem. Russian space officials have taken measures to prevent a repeat of such incidents. The accident was the first aborted crew launch for the Russian space program since 1983, when two Soviet cosmonauts safely jettisoned after a launch pad explosion. The Soyuz spacecraft is currently the only vehicle that can ferry crews to the space station. But Russia could lose that monopoly in the coming years with the arrival of SpaceX’s Dragon and Boeing’s Starliner crew capsules. I am glad they are alright! Can you imagine just going up in a rocket and then not knowing if it might blow up or not? That would be scary. I am glad they are alright but wouldn't it be lonely in space? Wouldn't it be bad if they didn't get along with each other up there, or got into a fight! Please stay safe astronauts. I want you to know that i am praying for you! I'm praying that they will work as a team together. I think space is pretty cool! My dad loves NASA, ( and so do I). Did you guys know that we beat Russia to the Moon? I'm excited to see the future of the space program, especially in the United States. I think it's super cool that private corporations like SpaceX and Boeing are getting involved in making spacecraft. It's amazing that we can explore the universe that God created and marvel at the works of His hands. It's always a good thing to persevere, but these astronauts really went above and beyond, trying it again, after the failed mission. That right there is courage!